A mother creatively conjures a running dialogue with her daughter as a means of processing her premature death. In February 2016, the debut author’s daughter, Chloe—only 28 years old—died from colon cancer. 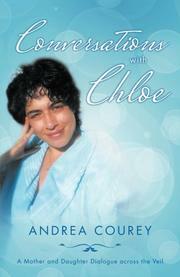 The following April, Courey began this book of imagined conversations between her and Chloe, and finished the collection in about three months. Not quite 55, Courey had not only lost her child, but most of her worldly possessions—her home, her marriage—and lived in a small lakeside cottage. Her son, Matthew, once an overachieving student on his way to law school, was so addled by drug use that his mind succumbed to schizophrenia. The author began this fictional assemblage of exchanges with Chloe—more dialogic than epistolary—as a fence against persistent grief. The conversations are wide-ranging—sometimes they’re an instrument of remembrance and cover Chloe’s academically promising early childhood, her tumultuous adolescence and addiction to crack, or the last days when her illness finally overtook her. A portion of the book is devoted to Courey’s reflections on entrepreneurship—she started a granola business with virtually no money or assistance. She even discusses a gradually blossoming romance with the man who owns the property she rents, and her longing for companionship and affection. The core of the book, however, is the philosophically searching reflections on the nature of death, and the grappling with it in life. Chloe discusses her own experiences on the “other side,” and Courey shares the details of an out-of-body episode she had as a consequence of a car accident. This is an eclectic and imaginative work—part memoir and part self-help manual, all of it written simply but deeply. The author’s quest seems to be the ceaseless hunt for spiritual transcendence within the confines of quotidian existence: “It’s about seeing the divine in the sublime and the heroism of everyday life.” Of course, the tale revealed in conversations is often a heartbreaking one, filled with loss and sadness. But Courey’s indefatigable search for beauty in the ruins of catastrophe is infinitely inspiring and impressive. An emotionally arresting exercise in the artistic overcoming of despair.